Let me just start by saying, that I cannot believe it is JULY! Which means it has been just over a month since I started my journey to become Summer Ready with SlimFast. Its also been the same time since the #SlimFastLunchClub started on a Monday lunch time, which have been an amazing help. It involves other slimmers, who share their tips and meal ideas. From these chats I have learnt new recipes - eg mixing my shake with other fruit to give to give it more flavour. When I started with Slimfast I was very scared, not even going to lie to you all. But the 3, 2, 1 Plan makes it less scary and easy to do. You pick 3 snacks a day, 2 meals, shakes or bars and 1 meal. It seems like a great deal, but I have found that meal planning on a Sunday so I know what I will be eating is a lot easier to do. Its also got me drinking a tonne more water, which I was doing anyway but the smaller meal size has made me drink even more. That was my first problem, the second was that I am a bigger 'snacker' throughout the day I am constantly needing something to munch on and it was getting out of hand. By the time the evening came round, I didn't want to eat because of the snacks I had eaten. The 3,2,1 Plan has instead helped me cut down snacking to a minimum, and the snacking that I do is healthy. The results? Well after a month I am down to a 12 from 14 in Jeans! Which isn't the smallest of sizes but for me my ideal size. After going up around this time last year, I wanted to go back down a size to make myself feel better - and I've done it. I'm still in shock but it feels amazing, the feeling of accomplishment is amazing. Its down to this FABULOUS plan, drinking more than my weight in water, control and a balance of exercise. Altogether has proven really successful. 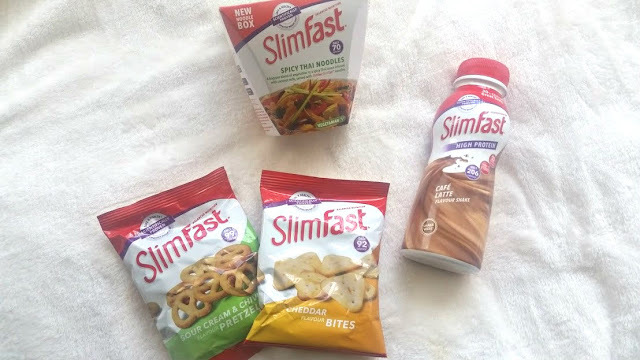 Through it, I have got some favourite products and thought of sharing them with you, since starting the collaboration with Slimfast I have repurchased most of the products and can't wait to carry on through summer! Hands down the Café Latte Shake is my favourite product of all time. There is just something about it that tastes good, fills me up and is just delicious. I usually have one for either breakfast or lunch alternating with the meal bars. 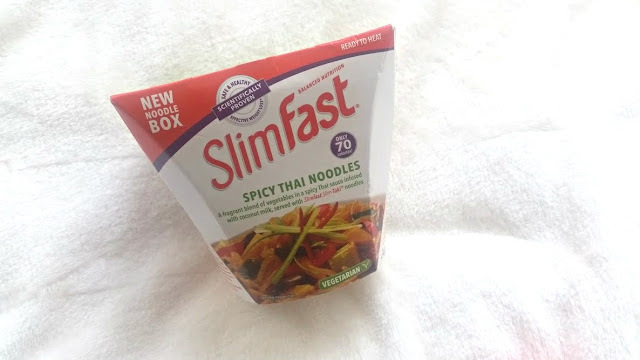 The Spicy Thai Noodles have been a great meal option for lunch whilst at work, a quick box of these and I'm pretty much full. I eat them with some fruit on the side and a snack which I will talk about below and that is my lunch done. Simplicity and ease is my motto in life and these are just amazing. Like I mentioned snacking is my main problem. 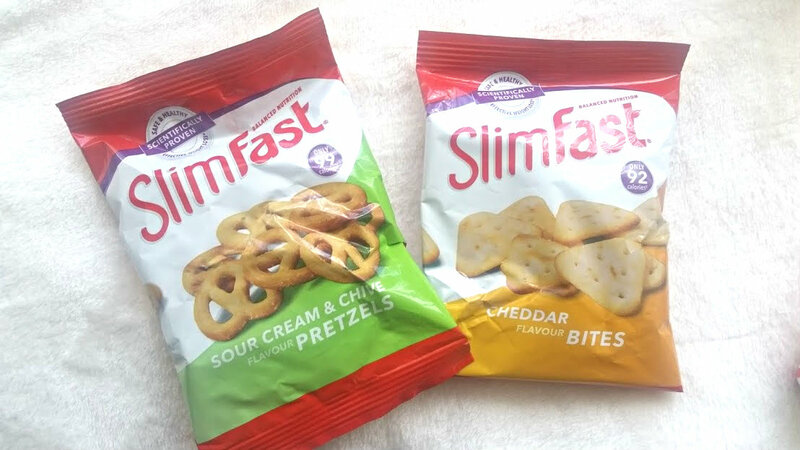 I usually snack on chocolate or crisps but a healthy and guilt free alternative are the SlimFast pretzels and cheddar bites. Both are under 100 calories and taste amazing. Too much for me to eat in one packet but splitting it over two snack times is just perfect. 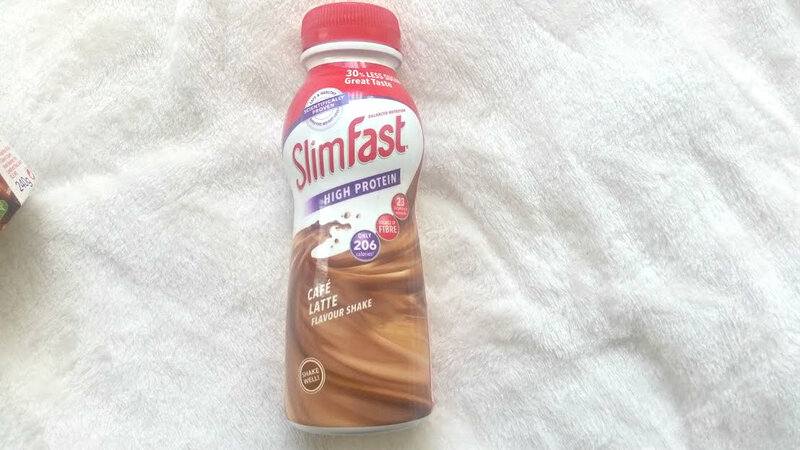 Overall, my whole experience with SlimFast has been amazing. I only recommend and talk about things that I am 100% confident with and trust and this is one of them. 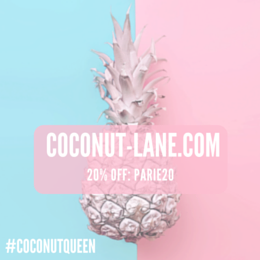 The 3.2.1 plan helps you to stay in control of what you are eating as well as relaxed and the wide range of shake, bars and snacks that they have on offer make it easier to reach your goal. Its fuss free, simple and easy to do! I've successfully reached my summer goal, whats yours?